How to be a Flight Nurse? RN, RM, Bachelor of Nursing, Post Grad Cert Emergency, Post Grad Cert Aviation Nursing and Post Grad Cert Primary Health Care, currently studying a Masters in Advanced Practice Nursing Emergency. Judi Shields first commenced Flight Nursing in 1988 in completing a 3 month orientation to Flight Nursing in Gove. 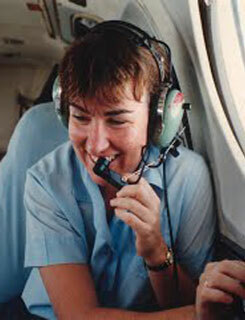 She was hooked and commenced as a full time Flight Nurse in Darwin in 1990. Judi has a background in Paediatrics, Midwifery, Emergency, Indigenous Health and Remote Area Nursing. Involved in the early development of Flight Nurses Australia Incorporated and on the Inaugural committee and served in various roles from 1995 to 2008 as Committee member, President and Secretary. In 2001 Judi was awarded a Winston Churchill Fellowship to further her research in the area of Fatigue in the Air Ambulance environment; studying at NASA and the United States Air Force. Remained involved in the development of standards for Flight Nursing at a national and international level. Participated as a committee member for ASA and as a member of the Aerospace Nursing section of Aerospace Medical Association. Judi presented her research regarding Fatigue at International and National scientific meetings. As a Flight Nurse, Judi worked for the Northern Territory Aerial Medical Service, the Royal Flying Doctor Service (Qld) and as a guest lecturer of the South Australia University to rewrite the Aviation Nursing Course number two. Judi remains passionate about standards for Flight Nursing Practice and Fatigue engendered by Air Medical Crews in the Aviation/Transport environments. Judi currently works as a Clinical Nurse for Retrieval Services Queensland.